I seriously believe the sour cream/condensed milk really do something in achieving a wet looking cake layer as a basic cake recipe doesn’t always result in such an outcome. I absolutely loved how this cake tasted and even decided to post the recipe despite not including the step by step photos I usually include in my recipe posts, (I wasn’t really making this for the blog, but this cake came out so good, I decided to post the recipe.) I really think the tang from the sour cream is very mild (you won’t detect any in the cake) so don’t be hesitant to use this frosting because not only does this taste good but the sour cream slightly thins out the frosting making it settle in more into the cake, yet firming up upon refrigeration (if that makes any sense.) This is a total must make if you like moist and yummy cakes. 1. Preheat oven 350 degrees F. Line and lightly grease two 9″ spring-form pans with aluminum foil. Set aside. 2. Place eggs and sugar into the bowl of a stand mixer and beat over high speed for 20 minutes. Add in the baking soda mixture. Then mix in the condensed milk and sour cream until well combined. 4. Bake 25-35 minutes or until done. Cool completely. 7. Frost the cake and garish with chocolate crumbs. Drizzle Dulce-de-leche on top and refrigerate. This Sour cream cake is so incredibly moist with the right amount of sweetness and hint of sourness for a delicious tasting cake. Preheat oven 350 degrees F. Line and lightly grease two 9" spring-form pans with aluminum foil. Set aside. Place eggs and sugar into the bowl of a stand mixer and beat over high speed for 20 minutes. Add in the baking soda mixture. Then mix in the condensed milk and sour cream until well combined. Bake 25-35 minutes or until done. Cool completely. Frost the cake and garish with chocolate crumbs. Drizzle dulce-de-leche on top and refrigerate. 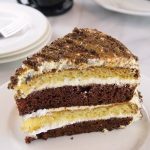 Can you freeze smeetanik cake? I think freezing the cake layers shouldn’t be a problem, but not so sure about freezing the assembled cake since the cream is made up of sour cream. You are very welcome, Ruta. Thanks for the feedback. Line pans with foil or wrap around outsides of pans? Thanks! Hey, would it be ok if I bake layers the day before and put together cake the next day? Yes! You can make the cake layers ahead of time and assemble the cake the next day. Please tell me what I can substitute for cool whip as we do not have this in Australia. You can substitute cool whip by beating heavy whipping cream with powdered sugar (about 1 cup of cream and 1/3 cup of powdered sugar) for the cool whip.